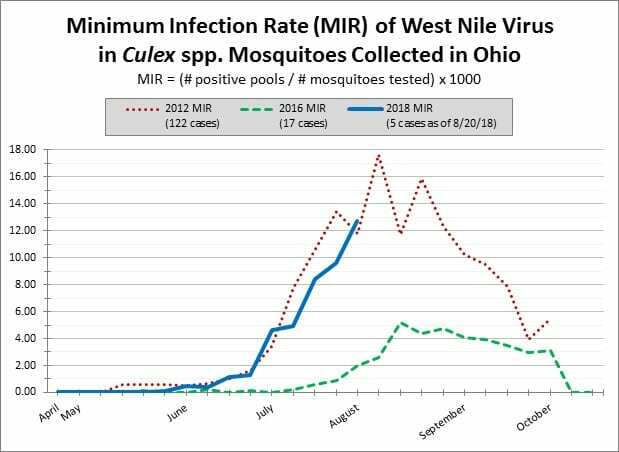 As of 8/20,2018, ODH is reporting 5 human West Nile virus (WNV) cases, including 1 fatality, and 2 asymptomatic WNV viremic blood donors in Ohio. Additionally, ODH received a report today from the Ohio Department of Agriculture of an equine case in an unvaccinated horse. WNV activity in mosquitoes continues to rise and we have now seen indications of virus activity in 52 Ohio counties so far this year. In addition to WNV, ODH is also reporting 6 LAC cases and 2 unspecified California virus cases. The rainfall we’ve had this summer has continuously filled tree holes and containers with water, creating ideal conditions for tree hole mosquitoes (vectors of LAC virus) to breed. For more information about arbovirus cases and surveillance data, see the current Ohio arbovirus surveillance update at http://www.odh.ohio.gov/arboupdate, updated earlier today. There are quite a few weeks left in this mosquito season and cases can occur into October, so it is very important to continue your community and public education efforts focusing on personal protection and source reduction. Also, please call the Zoonotic Disease Program (ZDP) at (614) 752-1029 if you have any questions. Posted in Diseases/Syndromes, Mosquitos	Bookmark the permalink.